C-FNFI in her piston powered days. N 379PM at Ketchikan, Alaska. N 379PM in the Dry Tortugas. • CF-NFI Stanair Ltd., (Stanolind Oil & Gas Company) Fort Nelson, BC. Delivered 29 March 1960. Accident: En route from Fort Nelson to a strip at Kotaneezee, 02-Jul-1962. Forced landing following engine failure. • CF-NFI Northward Aviation Ltd., Edmonton, AB. Regd Mar-1967. • C-FNFI Lac la Croix Quetico Air Services Ltd., Lac la Croix, ON. Regd Jan-1974. • C-FNFI Stellar Aviation Ltd., Campbell River, BC. Regd 02-Oct-2008. Canx 14-Sep-2010. Power-plant. Converted to Vazar PT-6 turbine. (Conversion No. 88). • C-FNFI Leased to Air Roberval, Roberval, QC. Regd 14-Sep-2010. Canx 01-May-2014. • C-FNFI Returned to Stellar Aviation Ltd., Campbell River, BC., and sold on to USA. • N379PM PM Aircraft II LLC., Ketchikan, AK. Regd 16-May-2014. 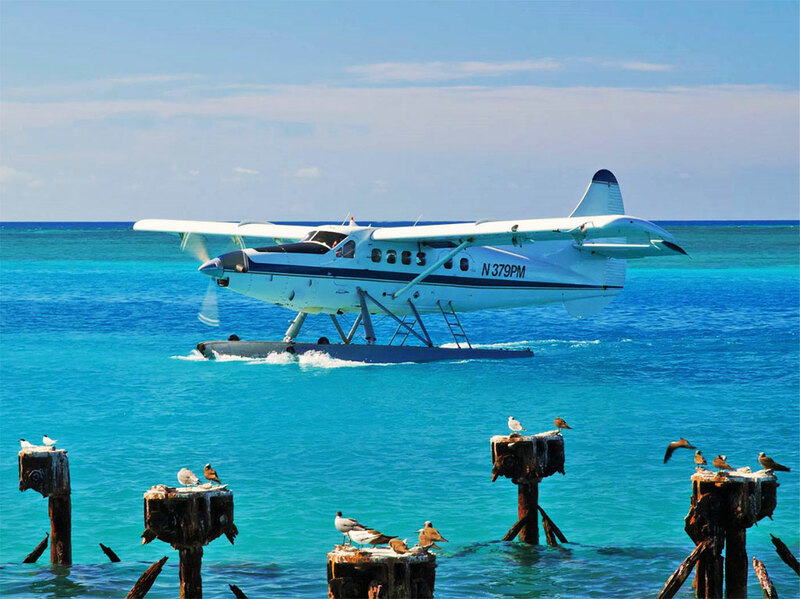 • N379PM Operated by Key West Seaplane Adventures (An Associate Company of Pro-Mech), Key West, FL. Circa Jan-2015. Note: Reported that as of May 2016 Pro-Mech assets acquired by Taquan Air Service Inc., following financial difficulties. Watch this space. Otter 379 was delivered to Stanair Ltd., Fort Nelson, BC on 29 March 1960, registered CF-NFI. This was the aviation department of the Stanolind Oil and Gas Company, which in 1953 had acquired two Beavers for use in exploration in British Columbia, Alberta, the Yukon and Northwest Territories. The Beavers were based at Fort Nelson and used to move and support seismic crews, surveyors and geologists around the boreal forests of northern Canada. Two Otters were added CF-ITS (90) in March 1956 and CF-NFI in March 1960. These four aircraft formed the core of the company’s aviation department. Otter NFI suffered an accident on 2 July 1962 when it force landed in the bush due to engine failure en route from Fort Nelson to a strip at Kotaneezee, 65 miles to the north. It was repaired and returned to service. In 1963 the two Beavers were sold and the following year Otter ITS was replaced by a Beech 18 (CF-PAP) which served as an executive transport. Otter NFI continued in service but DHC-4 Caribou CF-OYE was acquired in 1966 and the Otter was put up for sale the same year, and sold in March 1967 to Northward Aviation Ltd., of Edmonton, Alberta. Northward Aviation purchased NFI to replace their own Otter CF-JAO (129) which had been destroyed in a fire the previous month. This restored the Northward Otter fleet to four, which the company used to operate its scheduled and charter services in northern Canada. NFI was to fly for Northward for just under seven years, until it was sold in January 1974 when Northward was disposing of its Otter fleet. 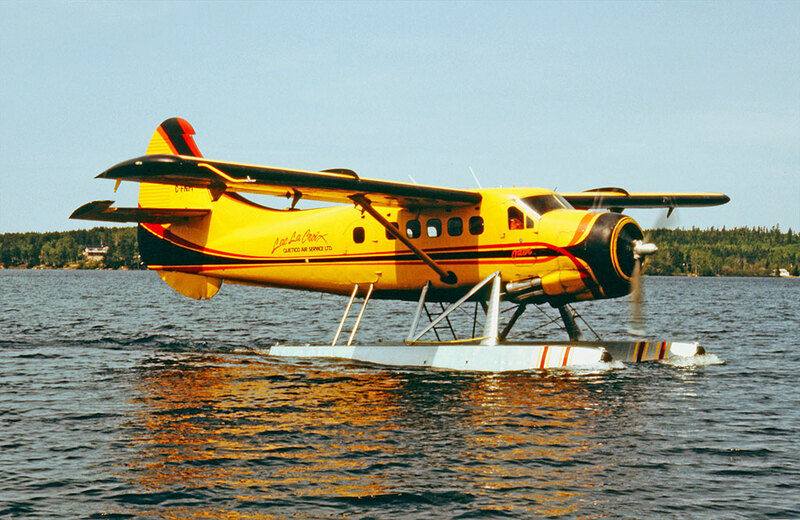 The buyer of the Otter was Lac la Croix Quetico Air Services Ltd., of Lac la Croix, Ontario to whom the Otter was registered as C-FNFI in January 1974. It was painted in a striking yellow colour scheme with black trim. The company was a division of Campbells Cabins & Trading Post and NFI was used to support the fishing camp at Lac la Croix, located in a very remote region of the Ontario bush country. Many of the guests came from the United States and the Otter was used to fly from the camp to Crane Lake and Ely in Minnesota to collect them, having to stop off at an island in Sandpoint Lake to clear customs before flying to the camp. It was also used for fly-out fishing, day trips from the camp for guests to other fishing locations. Otter NFI flew for Lac la Croix Quetico Air Services on these tasks for just under a record 35 years, until it was sold. All good things must come to an end and on 2 October 2008 Otter NFI was registered to its new owner, Steller Aviation Ltd., of Campbell River, BC. The Otter made the long flight westwards from Ontario to Campbell River on the Pacific Coast where work commenced in converting the Otter to a Vazar turbine with the PT-6 engine, conversion # 88. It was then advertised for sale or lease, available 15 March 2009. “Just completed overhaul and conversion to PT-6-34. Total time 15,500 hours. Price $1,440,000. On extended 7170 floats”. It was rolled out of the hangar at Campbell River mid March 2009 in a new white colour scheme with blue trim. Given the recession of that time however this Otter (as with most Otters then for sale) did not readily find a buyer or lessee and as at March 2010 it was still parked at Campbell River. 10 May Campbell River to Salmon Arm, BC; 2.2 hours; refuelled from drums; Salmon Arm to Gull Lake near Red Deer, Alberta; 2.3 hours. Mustang Helicopters met the Otter with fuel on a trailer. 11 May Gull Lake to Regina Beach, Saskatchewan; 3.2 hours; refuelled from drums; Regina Beach to Lac du Bonnet, Manitoba; 3.1 hours. 12 May Lac du Bonnet to Nipigon, Ontario; 3 hours; Nipigon to Temiscaming, Québec; 3.6 hours. 13 May Temiscaming to Val D’Or; 1 hour; Val D’Or to Dolbeau St.Felicien 2.2 hours. Total flight time had been 20.6 hours with favourable winds and weather. NFI then entered service with Air Roberval alongside C-FVVY (410). It was registered to Air Roberval Ltée., Roberval, Québec on 14 September 2010 (on lease from Steller Aviation Ltd). This was an entirely different Air Roberval than the company of that name which years before had operated Otters 135 and 348, during the 1980s/90s. NFI and VVY were joined by C-GLPM (147) in July 2011, to give the new Air Roberval a fleet of three turbine Otters, all leased. The company also flew four Cessna 208 Caravans and had its main base at Roberval with subsidiary bases at Temiscami, Schefferville and Pourvoirie Mirage LG-4. As well as supporting the usual hunters and fishermen during the summer months, Air Roberval also supported the exploration and mining industries year round in remote northern Quéebec, on floats in summer and wheel skis in winter. NFI continued to fly for Air Roberval for four years, when a decline in mining exploration in Québec resulted in a decision to terminate the lease of NFI and return it to its lessor, Steller Aviation, who in turn agreed to sell the Otter to Pro Mech Air in Ketchikan. At the time of the decision to sell, which was in April 2014, NFI was on floats at Roberval, buried in a five foot snow bank. Aviation R&L dug it out and got it into their hangar, where an 800 hour inspection was carried out, the Otter put on wheels and an export Certificate of Airworthiness issued. It departed Roberval on 29 April 2014 flown by an Air Roberval pilot. He left at 05:05 and landed at Geraldton, Ontario at 09:05. He was away again at 09:35 and landed in Bandon, Manitoba at 12:55. He took off at 13:30 and landed in Lethbridge, Alberta at 17:10. The last leg was to Vancouver, leaving Lethbridge at 18:00 he landed Vancouver at 21:25. He had completed a 2,200 mile trip in one day, flying 14.5 hours, quite a remarkable achievement. Good weather and tailwinds helped as did the long-range tanks. The registration C-FNFI was cancelled on 1 May 2014 and on 16 May 2014 the Otter was registered as N379PM to PM Aircraft II LLC., of 320 Dock Street, Ketchikan, Alaska. At Vancouver Harbour Air installed floats and a Pro Mech pilot picked up the Otter, refuelling at Campbell River and flying from there direct to Ketchikan where the Otter entered service with Pro Mech Air as part of its fleet of Otters, flying the cruise ship passengers on sight seeing flights. It flew on this task for summer 2014, was in store at Ketchikan over the winter of 2014/15 and flew again for Pro Mech Air for summer 2015. The owner of Pro Mech Air hailed from Florida and in May 2010 he had established an Otter operation in Florida, known as Key West Seaplane Adventures which was based at the Key West Airport and was associated with Pro Mech Air. 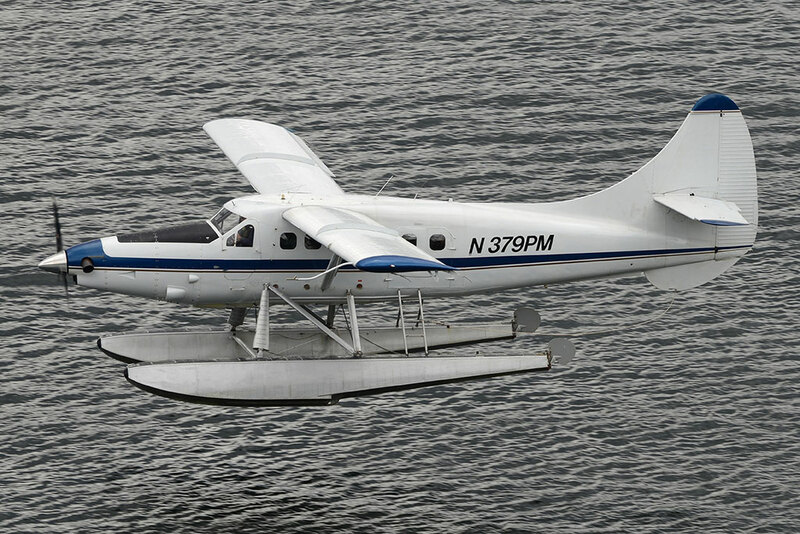 It operated tourist flights to the Dry Tortugas National Park, and Pro Mech Otter N435B (183) was dispatched from Ketchikan to Key West as its first Otter. It was joined by a second Pro Mech Otter N3952B (225) in November 2012. In November 2015 N3952B was to return to its lessor and N379PM was to be flown from Ketchikan to Florida as its replacement with Key West Seaplane Adventures. On 9 November 2015 N379PM left Ketchikan for the journey south. At 16:34Z that day, Kamloops Flight Safety Centre received from Ketchikan FSS a VFR flight plan for N379PM, from Ketchikan to the Seal Cove SPB at Prince Rupert, where it was estimating at 19:27Z. The flight plan was not properly activated, resulting in a failure to monitor the flight. After Seal Cove the Otter continued on to Campbell River where it remained for the next ten weeks. It resumed its journey on 24 January 2016, flying from Campbell River to the Renton Airport in Seattle. Its subsequent routing was: 25 January Renton to Ogden, Utah; 26 January Ogden to the Hays Municipal Airport, Kansas; 27 January Hays, Kansas to Eufaula, Alabama and 29 January Eufaula to Key West, Florida. At Key West N379PM entered service with Key West Seaplane Adventures, flying alongside N435B (183). A somewhat embarrassing incident occurred on 6 April 2016 as the Otter landed at Key West at 6pm on return from a sight-seeing flight to the Dry Tortugas. On board were ten passengers and the pilot. As the Otter was taxying off the runway, the right (amphibious) float collapsed, causing the Otter to collapse on the runway. According to a local newspaper report: “Passengers were commenting to one another how feather soft the landing was before they heard a crunch and felt the right side of the plane strike the tarmac. There were no injuries. The airport was closed for 90 minutes while the Otter was removed from the runway and an American Airlines flight diverted to Miami”. N379PM was repaired and was soon back in service. Full current history courtesy of Karl E Hayes including detail from his CD-ROM, DHC-3 Otter - A History (CD-ROM 2005) with further added information for the website.